Nos paquets sont expédiés sous 2 à 7 jours après votre commande. Our parcels are shipped 2 to 7 days after your order. Bubble wrap envelop or cardboard with protection Delivery with signature in hands The most secure shipping option! World : 1 to 3 weeks Bubble wrap envelop or cardboard with little protections Delivery without signature in your mailbox We decline responsabilty in case of damage, as they are NOT insured. No items will be refunded or replaced. Delivery without signature in your mailbox We decline responsabilty in case of loss or damage, as they are NOT insured. No items will be refunded or replaced. Livraison en boîte aux lettres Nous déclinons toute responsabilité en cas de perte, de casse ou de vol. Aucun article ne sera remboursé ni échangé. 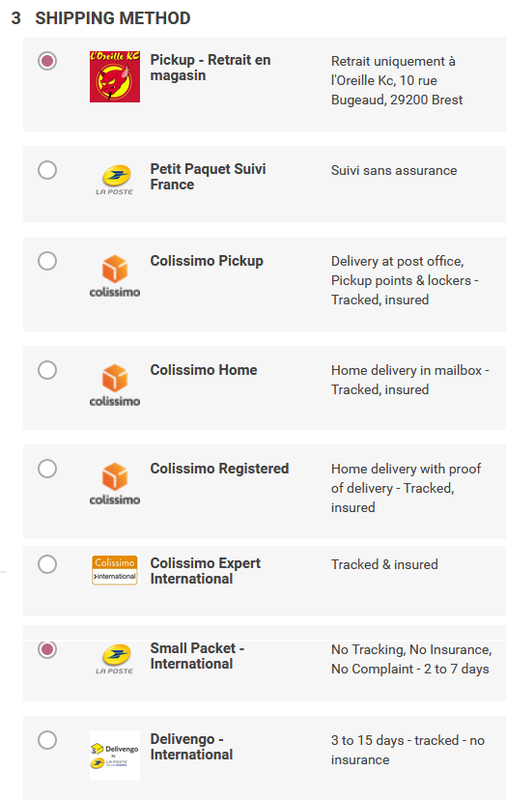 QUE FAIRE SI VOTRE COLIS EST ENDOMMAGE, ou PERDU? Sans quoi nous ne pourrons pas faire jouer l'assurance souscrite. Nous ne pouvons pas remplacer des articles qui ne sont plus en stock. Nous vous remboursons donc votre commande à hauteur de l'assurance souscrite. C'est à dire 23€ pour un Colissimo Simple, 50€ pour un Colissimo Recommande R1, 200€ pour un R2, 400€ pour un R3. Veillez donc à sélectionner un mode d'expédition correspondant au total de votre commande, sans quoi nous ne pourrons rien faire. QUE FAIRE SI L’ARTICLE NE CONVIENT PAS ? Retournez nous l’article à l’adresse ci-dessus dans son emballage d’origine. Nous refuserons tout article descellé. Refuse the delivery if you suspect the content to be damaged. Contact us immediately. The parcel will be shipped back to us and we will claim the insurance. We will ship another parcel as soon as possible. If the parcel appears to be lost, contact us immediately. We will claim the insurance and ship another parcel as soon as possible. If the product(s) delivered does not match your order please contact us via email ( steelwork.fr@gmail.com ) outlining the problem and we will arrange the return of the said goods. Please remember to include your original invoice number and the name your order was placed under. If the goods have a problem relating to the quality of the product such as a mis-print or a fault on garment, then a photograph as well as description of the problem should be emailed through to steelwork.fr@gmail.com for our customer services team to assess. We cannot take any action on an order until all of the goods are returned to Steelwork Maschine for inspection. Following the return of the goods a thorough assessment will take place following which Steelwork Maschine will deem whether the return is valid or not. If the problem relates to a production issue at Steelwork Maschine then a re-print of the goods may be offered to rectify the quality issue. Because every product is custom-made to your specifications, if the order has already been produced Steelwork Maschine retains the right to solely offer a re-print when seeking to rectify any problem with an order. A refund will be offered only when an order is cancelled prior to any work being undertaken by Death In June Merchandise. If you need to cancel an order you should contact customer services as soon as possible. Due to the short turnaround times we try to work to, your order may have already gone into production. If an order has been placed by the customer and subsequently produced by Steelwork Maschine a refund will not be offered on cancellation as the goods are custom-made to clients specifications and not stock items that can be re-sold. Failure to inform Steelwork Maschine of a problem within 24 hours of receiving the goods will mean the order is deemed to have been accepted and checked. We do not accept returns on samples or sample packs.